This has to be one of my favourite skin care products right now, exfoliating and cleansing. It helps to tighten and firm your skin. It also helps to refine the appearance of fine lines and reduces the pores. 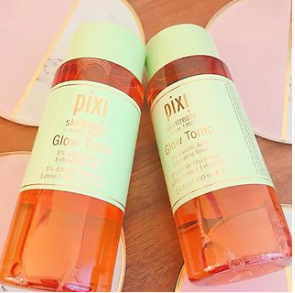 The glow tonic brightens, balances, heals and soothes for radiant and healthier skin. From first application, my skin felt so good and looked so radiant, I have been obsessed with this ever since. I like to apply it first thing in the morning and the last thing at night before bed. My skin feels so clean and fresh when I wake up the next morning. I like to use a cotton pad and gently sweep it across my face and neck. I like to follow with a moisturiser, it is such a simple and easy routine before bed, I have always found it hard to remember to cleanse with a facial wash cleanser, so this is perfect for people that like a quick routine. That feeling you get when you know you’ve cleansed your whole face and neck- I feel like I get a better nights sleep. I am going to continue using this product every day, they also offer this product for all skin types, so whatever skin type you have this product is perfect for you. I think Pixi Beauty’s packaging is stunning also, I can’t get enough of their products. Keep a look out for more reviews on their products.